Regular Joe: The Last Man To Hang - And The Crowd Sang "Champagne Charlie". The Last Man To Hang - And The Crowd Sang "Champagne Charlie". * I have written before on the grisly subject of public execution. And the recent commemorations of the Fenian Jeremiah O'Donovan Rossa brought to mind one of his comrades, the alliterative "forgotten Fenian from Fermanagh", Michael Barrett. The execution of 27-year-old Barrett, on May 26th, 1868, was the last public judicial killing in England. And the story around it gives us a flavour of how these events were huge public spectacles, carried out in a riotously macabre atmosphere, halfway between a sporting event and a street-party. Charles Dickens, a noted attender of public executions, was, regrettably, otherwise engaged. And Karl Marx, who had followed the newspaper stories of "Irish Fenian Outrages" avidly, only wrote about how the actions of the condemned man and his accomplices would turn the working classes against the cause of Ireland. Marx, a strong supporter of the cause, despaired that the terrorist acts carried out in Britain by the Fenians would prove counter-productive. On May 26th, 1868, 27-year-old Fermanagh man Michael Barrett was taken from his cell in Newgate Prison in London and brought to the scaffold erected outside in the public space. It was three days before a bill to end the practice of public execution would pass through Parliament. As the noose was placed around his neck and the last rites were read by a Catholic Priest, the crowd sang patriotic songs, including Rule Britannia and the most popular music hall song of the day, the jaunty "Champagne Charlie". Public executions were the spectator sport of the mid-Victorian age. Special trains would be laid on to bring vast numbers to the hanging of particularly notorious criminals. The press reported them avidly, special broadsides, pamphlets and souvenir newspaper editions would be printed immediately afterwards, giving those who could not attend a full account of the event. They were popular days out for the Quality, the well-dressed gentlemen & ladies who would pay money to rent good views from rooms overlooking the execution spot, a chance to go "slumming" amongst the teeming masses. Ladies would often dress in elaborate black satin and silk "mourning dresses" to mark the occasion. Six months previously, another crowd had watched the hanging of the Manchester Martyrs, three Irish Fenians who had tried to liberate some comrades from a horse-drawn police-van. A policeman had been shot dead. Barrett was convicted of another, greater outrage, the bombing of Clerkenwell Prison, another botched attempt at liberating comrades, in which a huge "infernal machine" (a bomb) had been placed against the wall of the prison. It blew a 60 yard gap in the Prison wall, but demolished nearby tenements, killing 12 people. 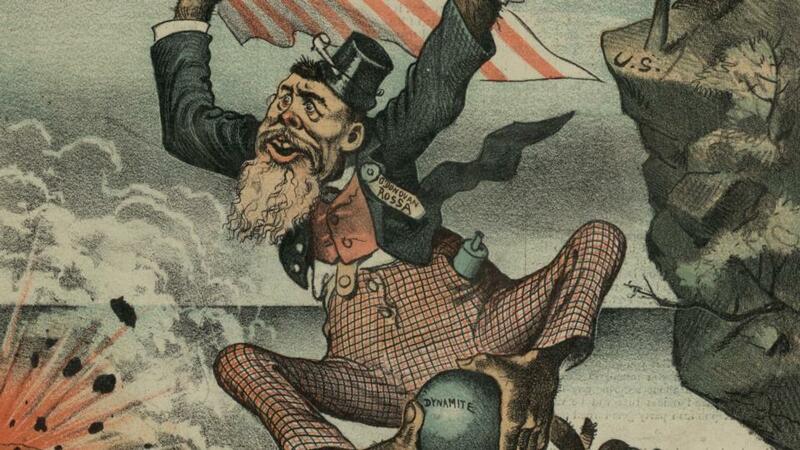 In the popular press of the day, individual Fenians like O'Donovan Rossa (and his U.S. sympathisers) as well as the Irish in general were depicted as brute apes, monkeys sitting atop gunpowder barrels. Such was the outrage at the Irish Gunpowder men, the authorities were pressed to act fast. And even though the public hangings were about to be ended, the last to hang would be a young Fermanagh man, son of a farmer, an Irish Fenian. Barrett has protested his innocence, claiming to be in Glasgow at the time of the explosion. The Crown brought forward witnesses to say he had been in Clerkenwell. One Fenian, Patrick Mullaly, escaped prosecution by turning Crown Witness to say that it was Barrett himself who lit the fuse. The young man was a Fenian. But there was strong evidence to say he was in Glasgow at the time the bomb went off, and the Crown case rested on some very questionable eye-witness evidence. No matter, the Disraeli government was under severe pressure from all sides over the "Fenian Panic". Some man had to hang. Barrett made an eloquent speech from the dock, proclaiming his innocence of the act but affirming his readiness to die for the cause of Ireland. Of the hanging itself, it went off without the kind of mob-violence often seen at these events, when drink, excitement and the prospect of seeing a criminal dance at the end of a rope often got the better of the vast crowds that would assemble. A lengthy sketch in The Times the following day said; A very wide open space was kept round the gallows by the police, but beyond this the concourse was dense, stretching up beyond St. Sepulchre’s Church, and far back almost, into Smithfield—a great surging mass of people which, in spite of the barriers, kept swaying to and from like waving corn. Now and then there was a great laughter as a girl fainted, and was passed out hand over hand above the heads of the mob, and then there came a scuffle and a fight, and then a hymn, and then a sermon, and then a comic song, and so on from hour to hour, the crowd thickening as the day brightened, and the sun shone out with such a glare as to extinguish the very feeble light which showed itself faintly through the glass roof above where the culprit lay. It was a wild, rough crowd, not so numerous nor nearly so violent as that which thronged to see Muller or the pirates die. In one way they showed their feeling by loudly hooting a magnificently-attired woman, who, accompanied by two gentlemen, swept down the avenue kept open by the police, and occupied a window afterwards right in front of the gallows. This temporary exhibition of feeling was, however, soon allayed by coppers being thrown from the window for the roughs to scramble for. It is not right, perhaps, that a murderer’s death should be surrounded by all the pious and tender accessories which accompany the departure of a good man to a better world, but most assuredly the sight of public executions to those who have to witness them is as disgusting as it must be demoralizing even to all the hordes of thieves and prostitutes it draws together. Yesterday the assembly was of its kind an orderly one, yet it was such as we feel grateful to think will under the new law never be drawn together again in England. They had gotten what the came for. 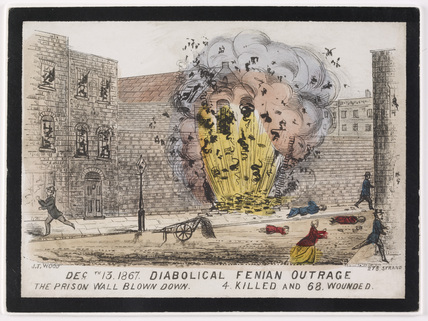 Revenge for the Clerkenwell Bombing, the spectacle of one of the Fenian Bogey-men hanging from a rope. They had even got to sing "Champagne Charlie" and seen the quality, the well-dressed society men and women who would pay local householders to secure a good seat by a window over-looking the gallows. It was the last spectacle of its kind in London. Michael Barrett was the last man to hang in public. 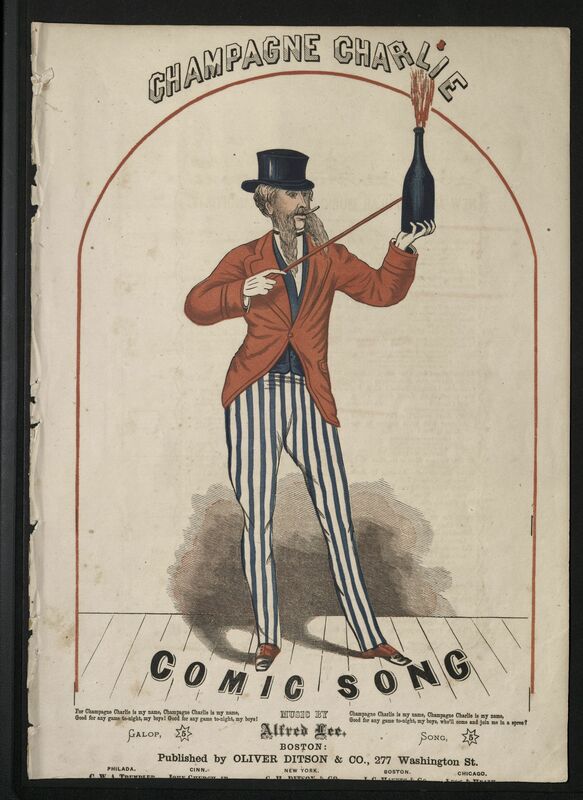 One of the last sounds he heard before the trap-door opened was thousands of Londoners, singing the music hall ditty of the day, "Champagne Charlie". Champagne Charlie is my name...."